A Welcomed Purchase: Bob Mechikoff fell in love with the wooden Chris-Crafts while growing up and spending time in the Long Beach marina. He made a promise to himself when the time and circumstances were right, he would own a “beautiful, classic, all-mahogany, wooden Chris-Craft.” When he felt ready for such a purchase, he looked for about two years before he found the one. He made the purchase 10 years ago. Restorations: The classic vessel, Wicked, needed to undergo an entire restoration, according to Mechikoff. Over three years, he had her professionally restored. The wooden boat has a brand new all-mahogany bottom and 10 coats a varnish. She also has a new impeller, carburetor, spark plugs, plug wires, battery, cooling hoses as well as a rebuilt distributor and electronic ignition. The original engine was repowered with a 350-Chevy engine, which is why Mechikoff said she is so fast. She is designed to go fast (about 50 miles per hour on flat water), as she is a Racing Runabout. Unique Feature: The boat has a chrome bubble over the hatches to house the carburetors. Mechikoff possesses the original Hull card from which she was one of three boats in 1949 with a 6-cylinder KBL motor with three carburetors. The chrome dome was necessary, since the carburetors stuck up so high. 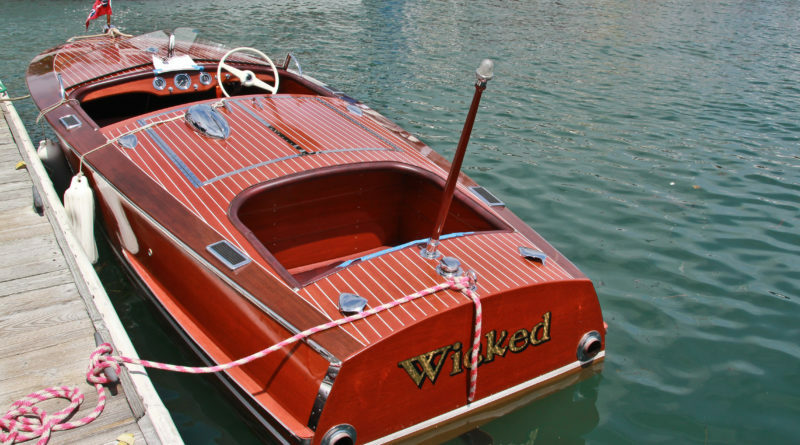 Current Uses: Wicked has been in several wooden boat festivals, consistently winning second place. Inquiries have been made to include her in professional photo shoots, but Mechikoff has not had the time. She occasionally gets to run around the harbor. She provides good “mental health as far as spending time on the boat and seeing all the beauty that is in Newport Harbor and all of Orange County from the perspective of the water,” Mechikoff relayed. Berthed: The classic wooden boat is currently kept in dry storage in Newport Beach. 19′ Racer one of Chris Craft’s best models. I had one with an original MBL engine for several years. Wish I had it back.